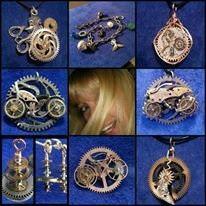 Closed my ETSY Shop – Chaordicwear – Up-cycled, One-of-a-kind, Handmade Jewelry you can Wear everyday! Making Order out of Chaos! OK, I closed my ETSY shop! ETSY is really going down hill fast. They no longer support the artists, it seems to be all about Quantity not Quality. I will be working on my site here to be adding a shop of my own. Hang in there with me since I’m not sure how to do it, it will take me a while to figure it all out. If you are interested in a piece, please let me know and I can send an invoice through PayPal. ← Upcycled clock parts and gears :) I have too many ideas of what to do with these. Any requests?